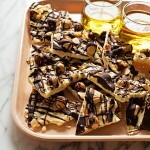 This post is in collaboration with #calmandbrightcookienight. 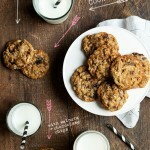 Visit The Modern Proper for the full list of cookies and links. Cheers, friends! I love that the holiday season brings a little bit of magic to the end of the year and often makes us feel more generous to our fellow humans. There are few things that give me the holiday feels like giving or receiving a tin of homemade Christmas cookies or treats. I love that so many families have cookie baking traditions and that a point is made to share those traditions with friends and family. I always think of my own grandmother’s variety of holiday cookies, my aunt’s fudge, and more recently my mom’s carrot cake–standby’s that have become favorites and I love that. This year I am continuing my own cookie baking tradition and baking all sorts of things from cakes to cookies for our friends and families, including these Lemon Pistachio Linzer Cookies. 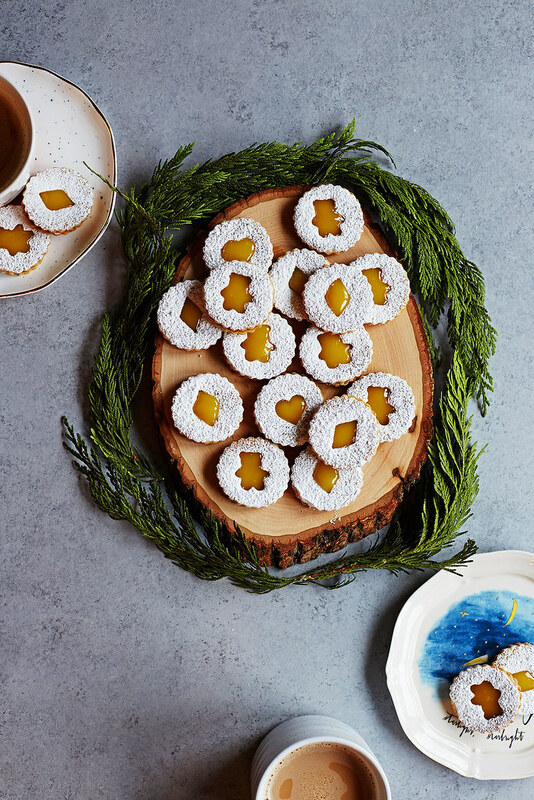 These cookies are inspired by classic Linzer cookies with their jeweled jammy middles, but they stray from tradition with a cookie flavored with ground pistachios and sandwiched with bright lemon curd. 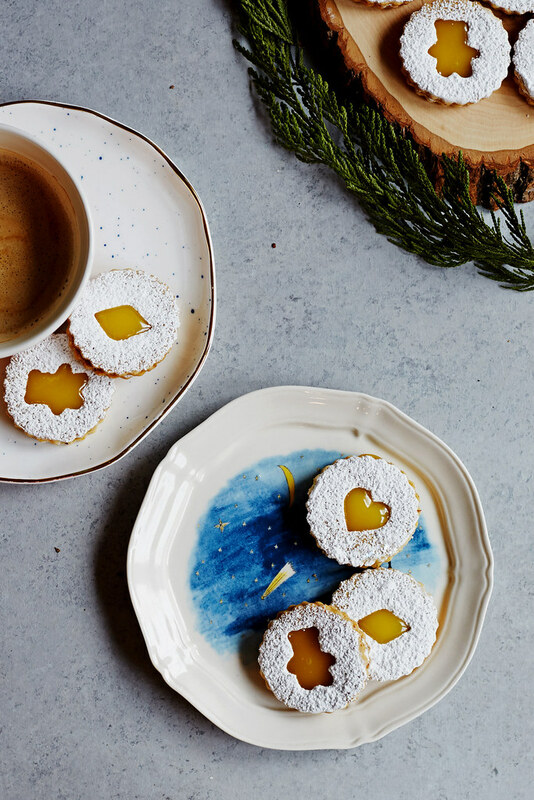 They are the perfect cookie for any lemon bar loving friends or family you might have since they end up tasting pretty similar but with a foundation of buttery pistachios instead of your basic shortbread. You can, of course, buy lemon curd for these but I encourage you to make your own if you never have before. It’s so easy to do, you literally put everything in a pot and stir until thick, that’s it, but the results feel like they must have taken much more effort. My recipe for Meyer Lemon Curd works well with regular lemons, too! 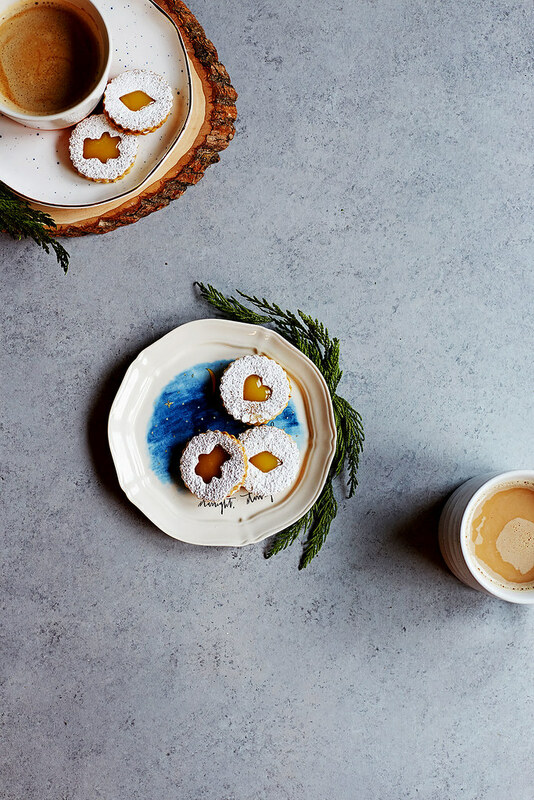 These Linzer cookies stray from tradition with a pistachio studded dough and tart lemon curd middle. Whisk the flour, baking powder, and salt together in a bowl, set aside. In a food processor, pulse the pistachios and confectioners sugar together until finely ground, but not pasty. Transfer the ground nuts to the bowl of a stand mixer fitted with the paddle. Add the cold butter and granulated sugar and beat until pale and fluffy, about 3 minutes on medium speed. Add the vanilla and egg, beat to incorporate. Scrape down the sides and bottom of the bowl, and mix in the flour until just combined. Gather the dough into two halves and press each into a flat disc and wrap tightly in plastic wrap. Chill until firm, about 2 hours. When you are ready to bake, preheat the oven to 375°F and line two baking sheets with parchment paper. Roll out one disc at a time on a floured surface to about ⅛ of an inch. 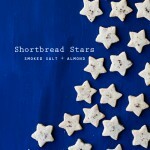 Cut out shapes with a Linzer cookie cutter, then cut the centers out of half of the cookies. Gather the scraps and repeat. Place the cookies on the baking sheets (you'll probably have to bake these in a few batches) leaving about an inch between each and bake until pale golden, about 8 minutes. Let the cookies cool on a wire rack before filling. 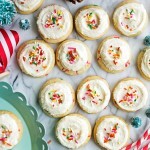 Sprinkle the cut-out middle cookies with confectioners sugar, these will be the tops of the cookies. Spread the lemon curd on the bottom cookies and top with the cut-out cookies. *Find my Easy Meyer Lemon Curd recipe HERE. If you don't have a Linzer cutter set, use a biscuit cutter or any basic shaped cookie cutter you have and cut out the center using a plain piping tip or other small shape. I used this Linzer cutter set. love this! i automatically thought this was lemon poppy seed because i saw the “lemon p-” and my brain autocompleted the rest of the phrase, oops. this sounds delicious though, especially since i’m the person who is game to put lemon curd on toast and call it breakfast. Prettiest little beauties. Those plates too! These are fabulous Cindy! 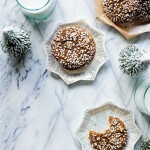 I’ve never tries linzer cookies before but I really want to now! These look great! cannot wait to try them! 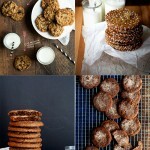 These photos are beautiful and the cookies look fab. Teach me your skills!!! :) Merry Christmas, lady!